We do not want to escape; we want to face it for what it is. But we want to see it in such a way that we see the goodness, we deal with the badness, we see the goodness, we see the bad but we see the opportunity of how we could try to do something wonderful according to our capacity, and that brings us bliss. To know we are trying to actually help brings us inner and true satisfaction and that takes a positive attitude based on knowledge. As long as we are attached to being the enjoyer of this material energy, as long as we have selfishness, greed, envy, and pride within our heart, there is going to be so many frustrations because we are trying to exploit. Now if we can serve by controlling – our motive is to serve – that attitude is free from selfishness is liberating. It is the actual supreme most positive attitude to serve in all situations with complete faith in God. Faith in the goodness of God and the potential in every possible situation. And how does that state of consciousness come? Through association. If you are associating with negative people you will become very, very negative. In fact I was speaking to a very, very high level managing consultant, and he said that even in a company, one person who is seriously negative can spoil the whole operation. Just a bad apple could make all the apples turn bad. It is depressing to be with somebody who is negative and complaining. Is it not? And to associate with those free choices that bring us closer to God, that increase our faith in God and simultaneously raise our values in life, that will transform our hearts. 20 Responses to "“No! Spirituality is not about escaping the world”"
want to serve…. Loved these statements by Radhanath Swami. Really liked the example of bad apple by Radhanath Swami Maharaj. How one bad apple can destroy so many more apples in the lot. Similarly negativity created by one person affects so many. Similar hope and enthusiam of one person creates positive atmosphere and gives hope and enthusiasm to so many. spirituality is not escapism rather we see the devotees are the most busy. they start their day early in the morning and engaged in so many activities for the service and glorification of lord. True. This is exemplified by Radhanath Swami himself. From the very beginning of his devotional life, he has been super-engaged in so many activities and projects. Beautiful and subtle points are brought about here by HH Radhanath Swami Maharaj that stirs the bottom of the heart and inspires to strive for perfection. Yes…following spirituality means to accept to serve without any interior motive or without any selfish desire. I have seen people who have dedicated their life to serve and spread the spirituality in society with such high spirit to help others. Like others, I have been benefited with selfless service such dedicated devotees. As here H H Radhanath Swami Maharaj explained, Krishna’s devotee with lots of positive attitude and positive energy help others and enlightens others life, which is very need of Society of present time. Yes, this kind of genuine devotees are the need of the present time. Agree. 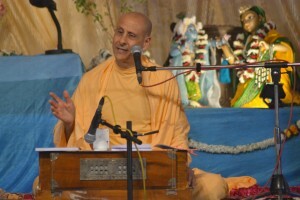 Fortunately Radhanath Swami has created many genuine devotees. very aptly put by Maharaj. The general tendency of people is to brush away spiritualists into a “escapist” category and say oh there’s a lot of time for doing spirituality. In actuality they are the one’s who are “escaping” from the teaching of Lord Krishna. Maharaja has very nicely explained about the importance of spirituality and how we can perform devotion while doing our duty. Thank you. how can we differentiate spirituality and religious values? Thanks for your question. Pls go through the article below. I believe it will clarify your doubts. Excellent article by Radhanath Swami. Association with positive attitude people makes us take shelter of God during our difficulties and otherwise also. Very inspiring talk. We should all adopt this attitude which will make life so much simpler and happier. Very good advice by Maharaj.